Monster clean is Chesapeake’s leading carpet cleaning company for both residential and commercial properties. We utilize the industries best equipment, offer the lowest prices, and have the greatest employees, allowing us to provide the highest level of service and quality to our customers. Our Carpet Cleaning Chesapeake VA team can handle any task related to carpet, tile, or upholstery. Let us revive your carpet to new, so you don’t have to spend extra money to replace it. Pet odors, stains, and tears are just a few issues our team is skilled and trained to fix. Monster clean is dedicated to provide your home or business space with a clean and healthy environment. We have the skills to eliminate pet odors, dust, mold, and any other filth that has built up over time on your surfaces. Monster Clean is one of the only local Chesapeake VA carpet cleaning companies that is certified by the IICRC. The IICRC sets the standards for the cleaning industry, and suggests specific products and applications depending on the type of cleaning job. Each one of our employees is trained and certified to take care of any task involving your carpet cleaning Chesapeake VA, upholstery, or tile and grout cleaning. Depending on your carpet, we will select a cleaning product and treatment option that caters to your specific carpet. Carpet manufacturers typically recommend truck mounted hot water extractor units to clean carpets. We are currently one of the only local companies to utilize truck mounted carpet cleaners, which is why we have the best results compared to companies that utilize outdated or cheaper equipment. Pre-Inspection: MonsterClean will walk with you throughout your home to inspect the carpet. Possible permanent stains will be noted, and you will be provided with an evaluation of expected results. Pre-Vacuum: Dry Soil is removed with extensive vacuuming. This is one of the most important steps in the cleaning process. Furniture Moving: This will include moving sofas, tables, chairs, and other small items. Monster Pre-Conditioning/ Pre-Spot: A pre-spray treatment is applied to traffic areas and general spots for a more thorough cleaning. The proper detergents, in the proper order, concentration and amount will be selected. A choice solution will also be applied to trouble spots to increase removal results. Pre-Grooming: A state of the art carpet groomer is utilized to further break up the soil. Agitation distributes detergents, working to loosen the grime. Monster Soil Extraction and Rinse/ Neutralizer: The carpet is thoroughly rinsed with the use of hot water and a strong extraction system, flushing out all soil and detergents, leaving the carpet free from excessive wetness and sticky residue. Neutralizer is applied to also ensure that sticky residue does not remain, leaving your carpet and soft. Monster Post-Spot/ Groom: Any remaining spots will receive extra treatment with our professional spotting solutions. Carpet fibers may benefit from a post carpet cleaning groom to ensure that there is no fiber distortion. Monster Dry: A high velocity air circulation system is immediately put in place to promote faster and more thorough drying. Post-Cleaning Inspection: Our Monster Clean technician will walk with you throughout your home to observe the cleaning results and to ensure that you are delighted with the work. Our technician will answer any questions you may have about routine carpet cleaning Chesapeake VA maintenance and offer A Big Monster Clean Thank You. Monster Clean technicians are highly trained in exceptionally advanced stain and spot removal techniques. A stain is a discoloration caused by a chemical reaction or by the penetration of a discoloring material into the yarn’s dye site. Spots are discolorations that have added color to your carpet and may require a color removal process for correction. A color loss stain (bleach, fading, etc.) may be addressed in some cases by a spot dye process or by replacing the affected area of carpet with a carpet patch. Even urine spots in carpets are removable. You are guaranteed 30 minutes of advanced stain treatment as part of your service. 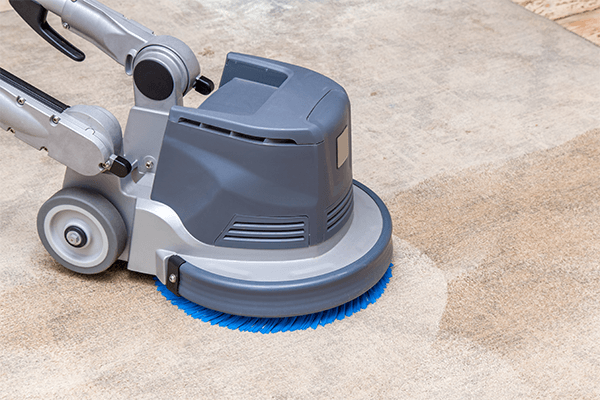 We can assure you that Monster Clean will exhaust every tool and technique at our disposal to correct unsightly discolorations in your carpet as part of our service. Monster Clean carpet cleaning Chesapeake VA uses only the best products for our customers. This is why we only use Teflon Advanced Carpet Protectant by Dupont for your carpeting. When protected with Teflon, your carpet and upholstery investment with be better protected by lasting much longer. Teflon is suitable for most cotton, polyester, nylon, and fiber blends. We provide Teflon services for carpet, sofas, chairs, ottomans, draperies, mattresses & other upholstered furniture. Teflon protects against stains caused by drink spills, food contamination, pet soils and will aid in keeping your upholstery bacteria odor free. The solution works when an invisible shield is formed around each fabric fiber, thus repelling liquids and soil. Your fabrics will be easier to care for. For the best results, we recommend Teflon application after every carpet and/ or upholstery cleaning. DuPont™ Teflon® is people and pet safe, has no odor, and is long lasting. Monster Cleans team will help create a work environment for your business that is healthy for your employees, and promotes productivity. Our team can help you extend the life of your carpets, and can restore the areas that receive heavy foot traffic back to like new condition. The equipment we use is the best in the industry, and allows us to clean large commercial spaces more efficiently, in the least amount of time. This allows us to work without inhibiting a work environment for an extended period of time. Carpet cleaning Virginia Beach, carpet cleaning Chesapeake VA, carpet cleaning Norfolk VA, and carpet cleaning Hampton Roads is a major part of who we are, but we also offer full service janitorial cleaning and cubicle cleaning. Give us a call today to restore your commercial space, and bring life back to your carpets. Most carpet cleaning companies shy away from oriental rug cleaning, but not us. We are certified and trained by the IICRC to be able to take care and restore any oriental rug. Our processes for cleaning and protecting oriental rugs is completely different from our traditional carpet cleaning methods, because it takes special processes to take care of oriental rugs. We only use IICRC certified textile cleaners, to ensure that we do not stain or cause any discoloration to our rugs. Monster Full Immersion carpet cleaning Chesapeake VA: When it has been determined that the Oriental Rug dyes are stable, your rug will be washed using our full immersion process. Pet urine odor generally requires deep remediation work. Pet odor is often much deeper than it may appear to be. It is highly probable that carpet padding and sub-floor contamination has occurred, thus causing the odors. While your carpet padding and the floor underneath may be contaminated, remediation can usually be accomplished without having to lift the carpet. The Monster Clean team are experts in the process of remediation. We pride ourselves on being able to remove odors when other companies cannot. Understanding the problem and limitations of each available solution is critical in making an informed decision regarding which remediation technique will be permanent and most effective. Urine crystals, or salts, dry into the carpet pad and on your sub-floor. These crystals are not easily re-liquefied by water or detergent alone, but they do dissolve readily in mildly acidic conditions. How is Monster Clean’s pet odor remediation so effective? Scientifically, we take advantage of our ability to dissolve urine salts and bacterial growth in acid by flushing a liberal amount of solution through your carpet and pad in the first step of remediation. Once the carpet, pad, and sub-floor have been acid flushed, live non-pathogenic bacteria and enzymes are introduced via planned and closely controlled localized “flooding.” The urine crystals are extracted in two stages. During the first stage, emulsification and removal of urine not liquefied by the acid rinse is accomplished. In the second stage, the area is saturated with a complex solution that “eats away” at any remaining urine residue. Once the two-stage flooding and extracting procedure has been accomplished, your carpet will be cleaned with our standard carpet cleaning Virginia Beach processes.